First before anything take some EVOO (keep it on hand you may use more) and put it in a medium sized frying pan, make sure a light layer covers the whole pan then turn up the heat and let it warm up for about ten minutes on medium to medium/high heat so once you’ve prepared everything you’re ready to fry the chicken. Next, get out your flour and put it in a small bowl. Next, prepare your breadcrumbs in a small bowl — make sure you add the garlic powder, onion powder, and Adobo into the breadcrumb bowl & mix it with any utensil quickly. Add dash of slat & pepper to the breadcrumbs for taste if you’d like. Crack two eggs in a separate bowl and whip them quickly for about a minute with a fork or spoon, add salt to taste. If you are using thin breasts cut them into halves or thirds depending on your preference. If you have pre-packaged, raw chicken tender pieces you can skip that since they already a perfect size. I got a great deal for a ton at Fairway for like $3 the other week and finished the rest tonight. I’m huge supporter of fresh rather than frozen, it’s much more cost effective, too! Now here’s the fun part–take your chicken and dip it in the egg so it covers the whole piece, then dip it into the flour, dip it back into the egg and then into the breadcrumb mix and onto the frying pan. I fry each piece for about 3-4 minutes so they are golden brown, feel free to add more EVVO accordingly especially if you’re making a big batch. Continue this until each piece of chicken is done. You may want to wash your hands in between batches if you make a lot like I did tonight, they get messy! Once all the tenders are fried–viola, you’ve now made homemade chicken tenders! I now refuse to buy frozen or even get chicken tenders when I go out because they are so easy to make at home. If you have your ingredients ready it takes about 15 minutes tops & that’s including set-up. Plus, it’s a great meal for about $10-12 depending on which chicken you get. They are my go-to recipe when I have chicken on hand and I want to make something quick after work! I’d love to what you think of the recipe once you’ve made it so feel free to leave comments! 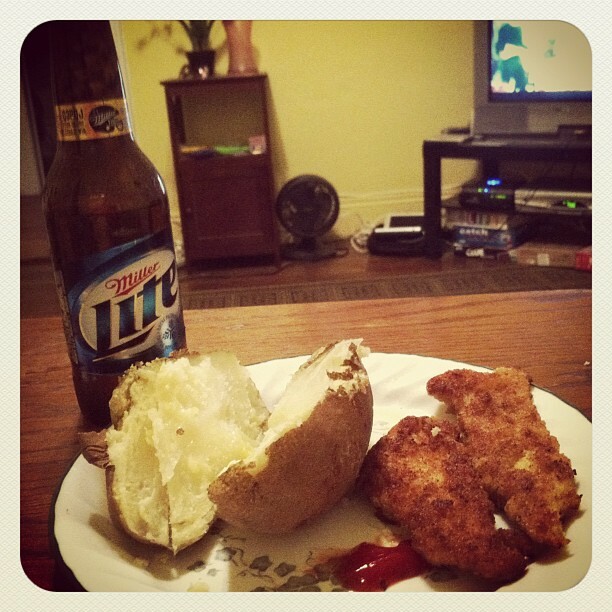 This entry was posted in cooking, Fairway Market, food, homemade, recipes, SCBD, Small Chick Big Deals, yummy and tagged chicken, chicken fingers, easy, fairway, homemade, quick, scbd by smallchickbigdeals. Bookmark the permalink.